www.photomacrography.net :: View topic - Question about aperture and extension tubes. Question about aperture and extension tubes. Posted: Wed Feb 15, 2012 12:27 am Post subject: Question about aperture and extension tubes. Am I correct in assuming this should remain the sharpest aperture when reversed? We then add on a some extension tubes. This changes the focal length the effective aperture changes, even though the lens its self stays at F5.6. Will the lens with tubes be sharper at the lens' native aperture, or should the effective aperture be adjusted? I would guess that the lens' native aperture would be best, but I am not certain. Bonus question! It seems that images get softer as more tubes are added. Is there a rule of thumb for how much you can push a set of optics before it falls apart, or is this just too case by case for anything like that? I would suggest you start taking a few magnification measurements to determine the magnifications at which you are working. That would be helpful for us to make some recommendations. There are (at least) two things your questions bring to mind. It is true that most lenses perform better (at "normal" distances) when closed down a little from maximum aperture. With a good lens this is often 1 or perhaps 2 stops. There is also an image degradation problem that is independent of lens quality that results from using too small an effective aperture (diffraction effects). So a conundrum in high magnification work is to come up with the best compromise.... an aperture small enough to improve the lens' image quality, while at the same time not getting so small that the effective aperture gets you in trouble due to serious image degradation due to diffraction. In pre-digital (pre-stacking) days, this compromise often meant biasing your decision towards accepting more "diffraction" than you would like, simply because you needed the DOF. With image stacking and a stationary subject, it is common to be concerned about obtaining maximum resolution in each shot, and controlling your DOF by the number of images in the stack. You do not give any indication of the lenses used, the magnifications obtained, or your camera format. It's possible to do some calculating to get a ball-park idea of the values you are after if you provide more detailed information. (But this can get a little more detailed than it would seem, since if you are reversing "regular" camera lenses you would really need to know the entrance/exit pupil ratio of the lens used to have adequate accuracy in your computations). Ultimately, it is far better to simply set up on a finely detailed, inanimate subject and do some test images at different aperture. With digital images it is extremely easy to do such comparisons and determine where performance is best. The measured magnification i have normally been working up to with decent results is just over 4:1 with the lens at 18mm and reversed. It is a 18-55mm lens on t1i(aps-c). I have used tubes to go up as far as 7:1 which caused a very soft looking image that was unusable. This is what spawned the question. I am aware of diffraction, but it doesnt look like the issue I have been seeing, though I could be mistaken. How would I go about calculating what the effective aperture is in a reversed + tube set up? I have dont a spread of tests before to try and find a good aperture, but it is a pretty big pain to be reversing a lens with electronic aperture over and over Honestly I prefer math + testing rather than just lots of testing. And I guess the theoretical question is how far can you go with a lens magnification wise before it starts to break down? Or is there no way to tell? How would I go about calculating what the effective aperture is in a reversed + tube set up? f_e = f_r*(1/P)*(1+(Pm)) gives the effective (working) f-number for an extended lens used in its reversed orientation. If your 18-55 is like mine, then P ~ 2.5, so f_e ~ f_r*(m+0.4). Wide open at 7X and f/3.5, you're looking at effective f/26. On a T1i, diffraction will start to degrade resolution around f/11 and will definitely be limiting around f/16-f/22. See http://www.photomacrography.net/forum/viewtopic.php?p=101164#101164 and followup posts. Diffraction based on the effective aperture sets an upper bound. The practical bound is lower due to aberrations, but how much lower is something you really have to measure. Most lenses end up being sharpest at least one stop down from wide open. I probably have the same 18-55 that you do, so see http://www.photomacrography.net/forum/viewtopic.php?t=15239 for some possibly relevant comments. Nice article on the lens. I have the second version of it as denoted by the grip on the focus ring, but its pretty much the same thing. Another question springs to mind. Why do lenses work well reversed at all? Aren't they designed to work at least at MFD distance - which would imply a fairly long extension when reversed. When used in the usual forward direction some lenses are known to have an "artificial" close-focus limit preventing the use of the remaining part of the focus helical, probably due to the increasing aberrations. I've noticed macro misuse by using extension tend to come at obvious cost. For example, a 50/1.8 on enough extension to make 1:1 is reasonably sharp only halfway into diffraction, gets totally smudged at wider apertures. I've never made serious "reverse stacking" attempts myself because I've got no suitable tele lens but I recall an argument that this approach is sound despite all the glass involved because both lenses are used within the design parameters. Any comments? One possible pro argument with single reversed lenses is that only the better central portion of the image circle is often used (well the remainder of the oversized image circle sometimes obviously causes veiling flare unless proper measures are taken). For example, a 50/1.8 on enough extension to make 1:1 is reasonably sharp only halfway into diffraction, gets totally smudged at wider apertures. True. I've read that this is mostly due to spherical aberration as mentioned by TheLostVertex. Fortunately stopping down is a powerful way of cutting spherical aberration. SA depends on the fourth power of aperture diameter, while diffraction depends on only the first power. So, shrinking the aperture by 1 f-stop reduces SA by a factor of 4, while making diffraction worse by only a factor of 1.4 (square root of 2). At 2 f-stops it's a factor of 16 for SA, but only 2 for diffraction; at 3 f-stops a factor of 64 for SA and 2.8 for diffraction, and so on. This is why even horrible SA can be tamed by stopping down while getting yourself only halfway into diffraction. The problem with SA is different from the problem with DOF, where both DOF and diffraction depend on the same power of the aperture diameter so you get deep into diffraction territory while making only modest gains in DOF. The argument has some truth but it's oversimplified. See FAQ: Stopping down a lens combo for discussion. I know it is oversimplified, that pairing lenses is tricky, stopping down too (I did manage to see once that the telecentric stop between two similar lenses works indeed). I was just wandering where I should look for adverse consequences of using single reversed lenses in the position they were obviously not designed for. And if you guys happen to have any practical experience of stacked reversing being better than single reversing. And if you guys happen to have any practical experience of stacked reversing being better than single reversing. For ordinary camera lenses, I don't recall ever seeing side-by-side test of a stacked lens pair versus the same front lens on extension. But the question piqued my curiosity so I shot one. The front lens here is a ancient Mamiya-Sekor 55mm f/1.8. For the stacked configuration I've used as the rear lens an even more ancient Sears/Ricoh 135mm f/3.5. 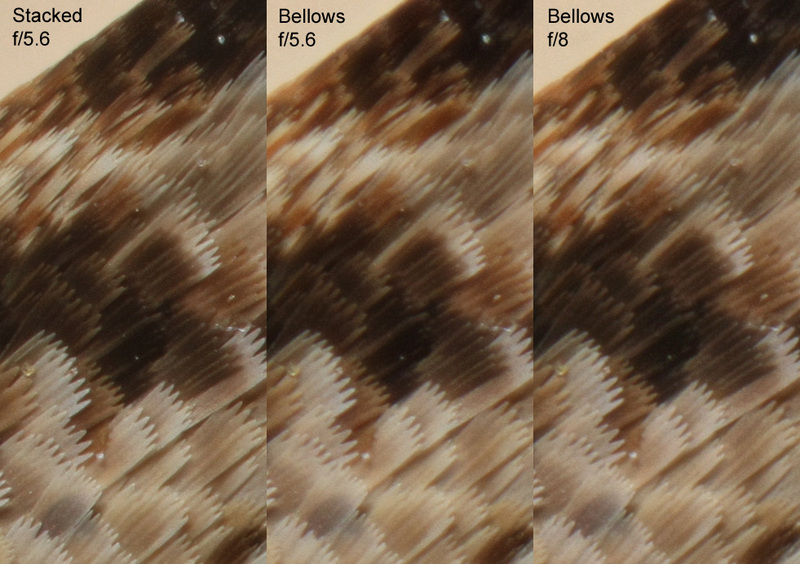 This gives a calculated magnification of 2.45, which I matched by bellows extension. Then using my Canon T1i (22.3 x 14.9 mm sensor, 4752 x 3168 pixels), I shot some focus stacks of a handy moth (Noctua pronuba) and ran them through Zerene Stacker PMax. Here are the results. Now, image corner. It's a different story here. The stacked lenses are significantly sharper than either of the bellows versions, and stopping down the bellows to f/8 doesn't make much difference. The particular reason of concern here is that image quality deteriorates when a lens is used much closer than its design limits. Trying to beat the system by inserting extension tubes between camera and lens, or by attaching supplementary optics to the front of a prime lens, will make that deterioration (called field curvature) evident, through fuzzy corners, slightly curved images of straight lines, and unsharp edges. The higher the magnification, the more these aberrations manifest themselves, and the smaller the aperture required for good results. 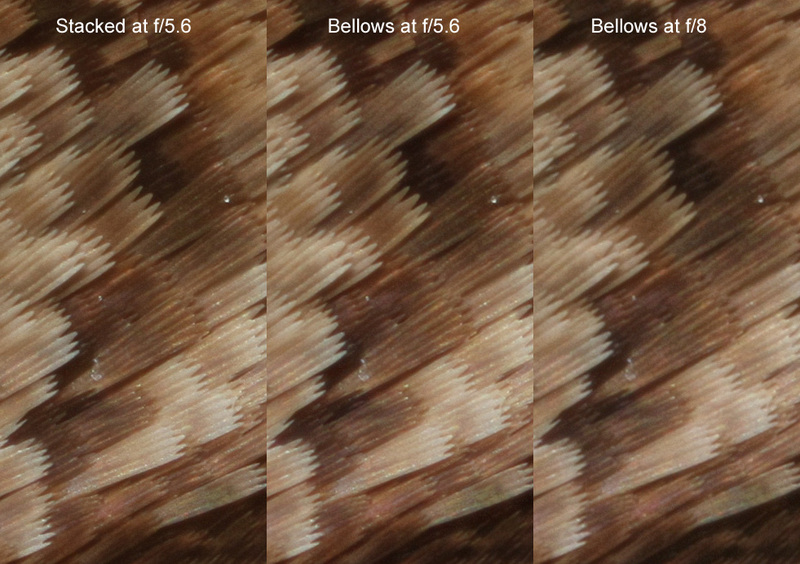 For magnifications of 0.5X (1:2), an aperture of f/8, and even smaller, is recommended. But if magnification is kept below 0.5X (1:2), and if small apertures are used, results can be surprisingly good for all but the most critical applications, such as photographing small flat objects or documents where edge-to-edge sharpness, uniformity, and freedom from distortion are needed. This description is playing a bit loose with the term "field curvature", but the key point is just that the image gets soft in the corners. In the case shown here, even stopping down doesn't help because we're already at the point where diffraction is kicking in. This is only at 2.45X (0.41X from the other side). Pushing this lens to 1:1 with just extension seems like a bad idea, consistent with Lefkowitz's comments, and if I recall correctly I only tried that trick once or twice, decades ago. Of course 1:1 is also problematic for stacked lenses because of vignetting. I have a couple of these 55 mm lenses, and when I reversed one in front of the other this evening, they vignetted pretty badly. That was stopping down with a regular aperture, not by adding a new aperture centrally located. It could be that adding a central aperture would take care of the problem, but that's quite a bit of trouble. My personal feeling is that the most practical way to do a good job at 1:1 is to use a lens designed for that application. I was just wandering where I should look for adverse consequences of using single reversed lenses in the position they were obviously not designed for. Thank you for the illustrative reply. So there appears to be sense in stacking after all And the outcome with bellows seems to be consistent with image degradation at close focus in the forward direction - we'd probably see more of it if we could see the whole image circle. Btw the smudging at wider apertures was present already in the centre of the image and got worse towards the corners, while the strong field curvature is an additional issue (but you would have avoided it by stacking). The Tamron 60/2 does not appear to suffer as much when pushing it a bit over 2:1 using the whole Kenko set. I gather damage due to extension is lens-specific. I think the issue with vignetting with both lenses wide open is a problem of poorly matching pupil locations. I've seen recommendations for proper stacking somewhere; with some lenses it is physically not possible to follow them and vignetting is inveitable. In other cases one can insert a bit of extension in between the two lenses to comply and still not have any vignette. Then stacking with just the reversal ring is supposedly "suboptimal", but I did not check quality. The central aperture is certainly trouble. It was originally recommended for the perspective, while the more practical aspect in one of my tests (???) was that neither of the two provided apertures would be useful for stopping down without introducing vignetting. The thing is that by stacking two lenses together the whole optical system changes. Thanks for the experiment rik, very informative. This raises another question for me though. So if one is stopping down the front of the lens pair, will the effective aperture be the same as a reversed lens on tubes or bellows set to the same magnification? I could only guess that they would be. So if one is stopping down the front of the lens pair, will the effective aperture be the same as a reversed lens on tubes or bellows set to the same magnification? No, the combo will be wider. In all cases, the effective f-number on the camera side is just equal to the effective f-number on the subject side multiplied by the magnification. Because the magnifications are the same, we can think about the effective apertures by concentrating on how things look from the subject's standpoint. Both lens configurations have the same entrance pupil diameter, which is determined by the front lens alone. But the combo has a shorter effective focal length than the front lens alone. So, when focused at the same magnification, the front lens will be closer to the subject when it is used as part of the combo. The combination of same diameter and closer means that the subject will see the entrance pupil as spanning a larger angle with the combo. That larger angle is equivalent to a wider aperture and a smaller effective f-number. If you want to compute how much wider, then assuming I haven't messed up the algebra, the exact values should be computable as follows. So, at same m and f_r, the combo's effective aperture is wider by a factor of (1+1/(Pm)). For my lens, P is about 1.1, so at m=2.45 the computed factor is about 1.37, roughly 0.94 of an f-stop. In a quick test varying exposure times to match the histograms, my rig says that a full f-stop is too much, 1/3 of an f-stop is not enough, and 2/3 of an f-stop is just about dead on. I'm not delighted by the remaining disagreement of about 1/4 f-stop (between 2/3 and 0.94), but it's close enough that I'm willing to wave my hands and assert "measurement error". You have the right expression, but you've made some arithmetic error that I can't figure out. What's being computed is the ratio of effective apertures between the two cases, combo versus front lens alone. If that ratio were sqrt(2) =~ 1.4, then the difference would be "1 stop". But it's a little less than that, so the difference is a little less than 1 stop. The number 0.94 can be computed using logarithms or by numerically solving the problem "1.4 to what power equals 1.37?" That's using rounded values for both numbers. More accurately, it should be "sqrt(2) to what power equals (1+1/(1.1*2.45))", for which the answer is around 0.910578 . But considering that I measured P by eyeballing with calipers at arm's length, even that second digit doesn't mean much. Either way, the discrepancy is around 1/4 of an f-stop from what I get by matching histograms and looking at shutter speeds. I believe I understand the rest now as well, thanks.